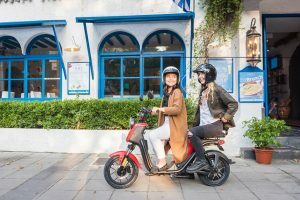 As electric scooters go, the NIU is flying with massive sales across Europe and impressive pre-orders now it has launched in the UK. A NIU can cost as little as £1,699 or (minus OLEV grant) £1,359 + OTR with 2 year warranty on the bike and 3year warranty of the battery. With zero emissions, exceptional build quality, lightweight construction and zero-carbon footprint, the NIU promises a new chapter in “earth-kind travel” at a price to please. You can be out and on the road for as little as £1359 + OTR as above and with virtually no running costs, that makes it incredibly cheap biking. Top-of-the range models, meanwhile, come in at under four grand. The NIU is powered by a compact and lightweight 8-10kg battery (depending on model) which you can remove and charge in approximately 3.5hrs at home or in the office and it has a range of up to a 100 miles. Developed from a Kickstarter crowdfunding project and co-founded by Li Yi Nan, and Token Hu – formerly of Microsoft – the NIU has received rave reviews. 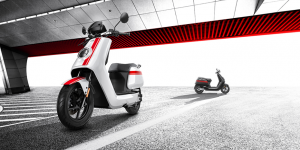 Forbes were quoted stating, this electric scooter was “Very likely to become the new Vespa”. It is praise indeed to receive favorable comparisons to possibly the world’s most iconic and trend-setting scooter brand. The U series, a smart scooter purpose built for the city. Vicky Harvey, Marketing Manager at Sinnis the UK distributors for NIU said: “We have sold out of the first three stock batches of NGT and the N series, and taking heavy pre-orders on the new U Pro. Want to see more of the NIU? Compared to traditional carbon fuel they cost virtually nothing to run. Electric scooters are exempt from standard rate vehicle tax and the London congestion charge. 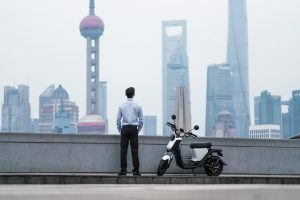 If you have an electric scooter you may have problems finding the right insurer, that’s where the motorcycle insurance experts at Bikesure come in. 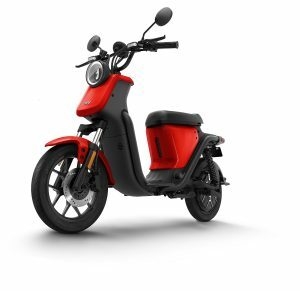 Bikesure have a range of affordable insurance policies for imported electric scooters such as the NIU. You’ve probably worked hard to find the bike of your dreams, we’ll work hard to find an insurance deal to match.